Navy and Marine Corps Achievement Medal w/ Combat "V"
Captain Dale Adam Dye USMC (Ret.) (born October 8, 1944) is an American actor, technical advisor, radio personality and writer. He is a Marine veteran of the Vietnam War. Dye is the founder and head of Warriors, Inc., a technical advisory company which is set to help actors play realistic military action in Hollywood movies. Dye has also offered his acting talent to television, such as the HBO miniseries Band of Brothers and The Pacific, and video games, including the Medal of Honor series. ↑ Rierson, Richard (March 14, 2013). 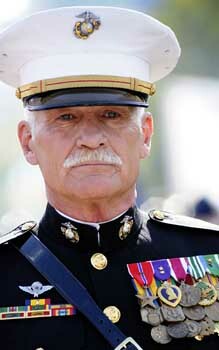 "26 – Dale Dye: Author, Actor, Founder of Warriors, Inc". Dose of Leadership. Retrieved 8 April 2015.